I have no words. For once, I am speechless. Let me just put it out there that I am so incredibly sick of this idea that for every second book in any fantastic series (with only a couple of exceptions) the main couple always – ALWAYS – breaks up or does something of the same nature like fighting and ruining the perfect relationship that it took the author the entire first novel to establish. To name a few examples: New Moon, Crescendo, Torment… even Onyx, to an extent. Sadly, Through the Zombie Glass was no exception, and by the third chapter, I was angrily texting the person who recommended the series to me about the author’s irritating choice of plot line. 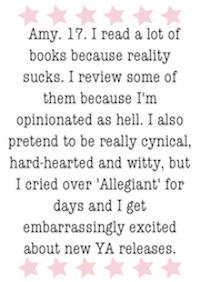 I wish I could say that it ruined the book… but it so didn’t. Even though I literally just wanted to toss the book out the window during the third chapter, I was still strangely drawn to it… and I am not in the least bit ashamed to say that from the moment I started reading it this morning at 10:01 a.m., I did not put the thing down. Like seriously. I didn’t even break to eat. The only times I was forced to look up from the page was when I texted the afore-mentioned friend, and the time that the little angel on my shoulder decided to shout at me for not drinking water and purposefully ruining my kidneys, to which I protested that Kat also had kidney problems and not once in the series had she been forced to drink water, so I could survive until the book ended before pulling myself out of my nest of pillows and blankets to go and fetch a bottle of water. So yeah, if I get any type of kidney stone or infection after this, Gena Showalter can pay my medical bills. 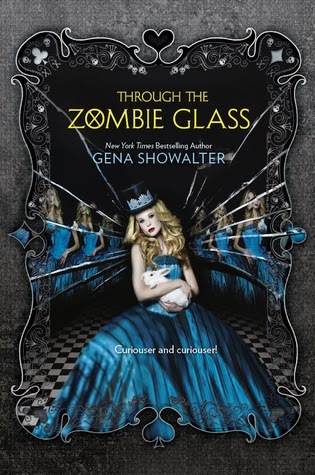 Through the Zombie Glass was even better than Alice in Zombieland. And that’s quite unusual given the fact that my opinion of it decreased by ten percent after the whole Alice and Cole fight thing. So the rest of the book must’ve really made up for that, considering I gave it five stars. As I said before in my review of Alice in Zombieland, the characters are so incredibly hilarious and lovable, and the author’s writing style is fantastic. I’m hooked. This series… just... wow. I highly recommend it, even if you think that you aren’t the zombie-book type of person.